One of most important things to do with operating system and any major of software is keeping it up-to-date to the latest feature to make sure we have the latest feature, improvements, bug fixes, and more! System update can be very crucial if it is related with security stuff. Imagine if there is a security hole in an operating system so the wrong hand can access your files, password, and any secret stuff on your computer. 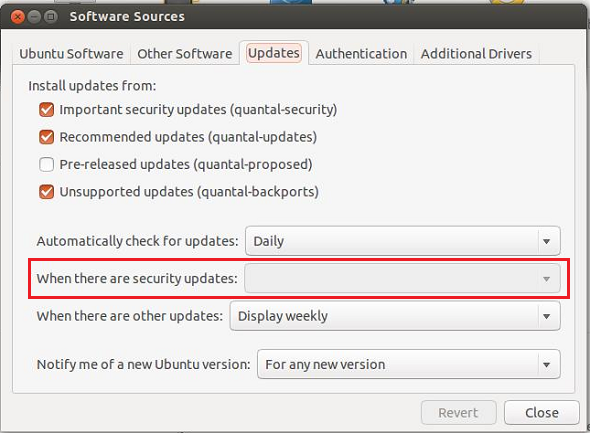 Although Ubuntu which is one of many Linux distributions is known as a secure operating system, you should not underestimate a system update, especially an update with related to security stuff. 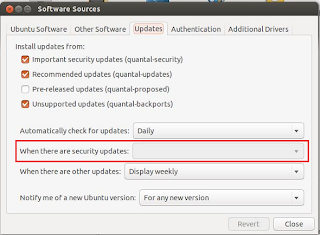 In Ubuntu, you can do a security update via command line or any GUI which provides an easy user interface to perform a system update, but you should do that manually so it can be a troublesome activity. So, today I'd like to share a simple trick so you can perform security update automatically, it also called "unattended upgrade". Highlight the "Yes" option (by pressing TAB button on keyboard) and press Enter. Once, unattended upgrade is enabled. The option "When there are security updates:" on Software Source dialog will be disabled. If you want to disable the unattended upgrade, please run the command again, and choose "No" when asked.